For their patient's benefit, advanced learning and the implementation of new technologies at the leading edge of dentistry is a constant for Dr. Matiasevich and his office. The friendly team is known for their down to earth and non-technical communication style making complex dentistry easy to understand. We are open daily to meet your Santa Cruz dentistry needs. 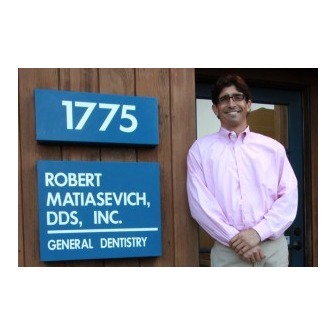 As a second-generation dentist, Dr. Matiasevich was raised in Santa Cruz. He did his undergraduate work in economics at the University of California Irvine and attended the University of Southern California for his dental degree. Later he returned home in 1997 to work along side his father. Dr. Matiasevich graduated with high honors from the University of Southern California and completed an advanced certification in Craniofacial Pain and Temporomandibular Joint Studies in San Diego. He has been helping patients so they can enjoy eating and smiling again with dental implants since 2000. He has developed special methods of implant dentistry to "rescue" the denture patient and those with debilitated teeth needing complete reconstructions. He has also developed special techniques in sedation dentistry for the fearful patient. All treatment is performed in the same office. This combined with advanced techniques allow even the most compromised individual to return to a life of enjoying dental health. Dr. Matiasevich offers a wide variety of dental services covering cosmetic, implant and restorative care. Our team can provide you with all of your dental needs in one location. Whether you are in need of periodontal (gum) therapy, a dental implant, denture or just a preventative exam.